Family, Laser, and Cosmetic Dentistry by Charlotte dentist Dr. Payet. While many cosmetic dentists claim to be “metal-free” dentists, too, I do not make any such claim. Why not? For a few simple reasons…..
Gold onlays and gold crowns are still the strongest and longest-lasting ways to fix broken teeth or teeth with cavities currently available, and if that’s what you want, then you want gold. Teeth stained by the antibiotic tetracycline can be so dark that is extremely difficult to bleach (whiten) them, except with Deep Bleaching (TM), and even porcelain veneers may have difficulty covering such dark tooth stains, so Porcelain-to-Metal (also known as Porcelain-to-Gold) crowns are sometimes the best choice. Bonding (tooth-colored fillings) usually does not hold up very well if you grind or clench your teeth intensely, as they aren’t hard enough to take that much force, so silver (amalgam) fillings are often a better choice. 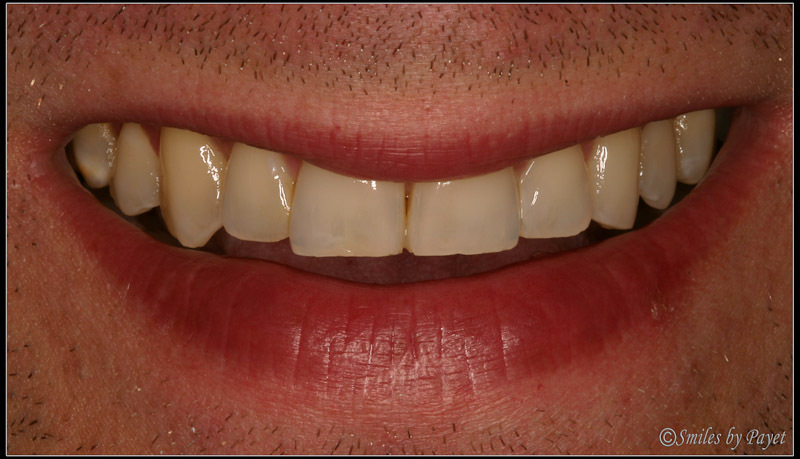 Here’s a case from a few years ago where the patient was really unhappy with his old, yellowed, kind of ugly old Porcelain-to-Metal crowns, partially because of the dark grey line at the end of the crowns where the black metal underneath the porcelain was showing as his gums receded. He only had crowns on the top 6 front teeth (a bad idea), and he wanted all of his teeth bright white, and he’d gotten the crowns initially because of severe Tetracycline staining of his teeth. They were the darkest teeth I’ve EVER had to treat. I’ll post something soon about how to create a beautiful smile despite tetracycline-stained teeth, but for this I simply want to show that dental crowns that are used to create a Smile Makeover can be just as beautiful and natural-looking as all-porcelain crowns. Replacing ugly old porcelain-and-metal crowns with a dark grey line at the gums with porcelain-to-gold crowns that look beautiful, natural, and white - to cover tetracycline-stained teeth. Yes – single-visit crowns can be beautiful! Obviously, the single biggest advantage for patients with our CEREC machine is the ability to have beautiful, all-porcelain restorations completed in a single visit. Here’s an example of how nice that can be. This patient had 10 porcelain veneers done about 2 years ago; due to her grinding habit, she had knocked off and broken one of the veneers. Rather than make a yucky impression and send it to the lab, while she had to wait several weeks with a temporary veneer, we made it right in the office. 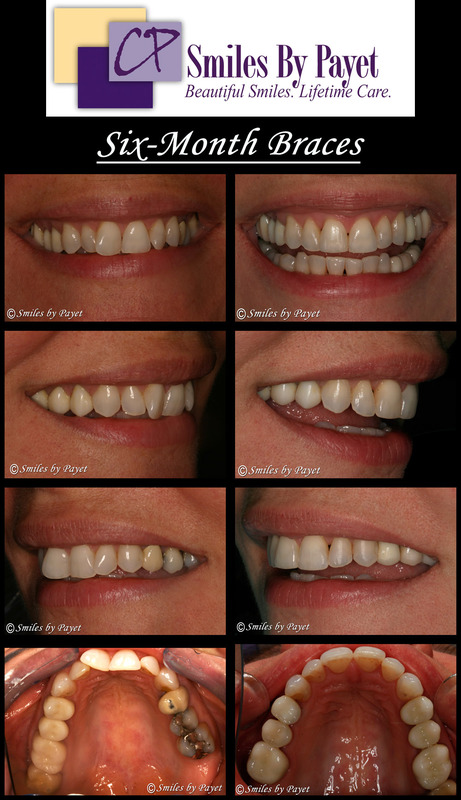 One visit porcelain veneer, no temporary, no second visit, and her smile was back to beautiful! See if you can guess which one was done by us on CEREC and which were done by the lab? If need your any tooth fixed, not just if it’s a porcelain veneer, CEREC CAD/CAM can do it for you. Call our office 704-364-7069 or Request an Appointment Online. This will be the last cosmetic dentistry/Smile Makeover video that I will post for a little while, as I next want to devote some time to showing how destructive “Grinding” of the teeth can be and why it is NOT something that you should take lightly. Bruxism/Parafunction (the general term for both grinding and clenching, which are 2 separate things) can cause major problems for patients, and often in ways not easily visible because it takes time to develop or they’re under the surface. I believe this is an area of dentistry that is often neglected, and it only makes things worse for patients. With that said, I do hope you enjoy the way we combined different kinds of treatments to achieve a dramatic Smile Makeover for Daniel, as visible in this video. Don’t forget – if you want to see all of the videos for our practice, check out our YouTube channel: SmilesbyPayet. Here’s another video to enjoy of patients for whom we’ve done Porcelain Veneers to achieve some remarkable smile transformations. As a professional photographer on the side (I don’t plan on quitting my day job any time soon), I have a passion for both the taking of pictures and the digital developing/use of those pictures, and software today is so remarkable in how it can be used. With increasing levels of integration among Photoshop programs and others, it is becoming increasingly easy to take the pictures, edit them as desired, and then quickly convert them into a usable format. I will be adding more videos to both our Blog and to SmilesbyPayet.com in coming weeks, so stay tuned for more! Tonight was the first meeting of 2009 for the Charlotte, NC area CEREC Study Club, which I founded shortly after I took possession of my CEREC 3D CAD/CAM system on December 31st, 2007. (If you’re unfamiliar with the terms, CAD/CAM means “Computer-Aided Design/Computer-Aided Milling.”) It was really a very exciting meeting (ok, most people probably wouldn’t find it really exciting, but we’re a bunch of dentists, after all, who happen to be kind of geeky and like hi-tech tools in our office which happen to provide really awesome results for our patients), as the manufacturer (Sirona USA) just recently released a tremendous new upgrade, the CEREC AC Bluecam, which uses a range of improvements in both hardware and software to drastically increase the system’s speed. Given the cost of the new unit, and since my CEREC 3D is only 13 months old, I’m not going to be introducing this new version to our office this year. The one we have, the CEREC 3D, is still an excellent system, and we regularly enjoy giving our patients the great experience of single-visit all-ceramic crowns and onlays with it. This means no temporary restorations, no second visit getting numb, no metal, practically no sensitivity afterwards……there’s really no downside. Along with the new system, Sirona USA is launching another terrific innovation that will also benefit patients, and it’s called CerecConnect. The difference is this: with CEREC, we can create 1-4 units of crowns and/or onlays in a row fairly easily, and even do all of them in 1 visit. However, doing a full arch (all the top or all the bottom teeth) is extremely difficult and typically requires great expertise and advanced training, and it will still usually take 2 visits. In addition, the regular CEREC can’t do things like bridges. With CerecConnect, however, we will still be able to completely eliminate using those gunky impressions that NOONE likes, because we’ll take a digital image of the teeth and then just email it to the lab. How cool is that!?!? I have a number of recent cases that I plan on posting here in the near future once I get the patient education videos completed. You’ll love what CAD/CAM can do in dentistry, for YOU! The digitization of dentistry is proceeding full-speed ahead, and the benefits are simply tremendous. New Patient Education videos now in the office! Oh, it feels so good to finally be able to announce this, as I’ve been working on it so hard for so many nights after my family has gone to bed, but FINALLY I have begun producing some new Patient Education videos to help explain a number of options that we offer by using pictures of many similar cases. We’ll look forward to showing you these new videos when you come in! Don’t have any of those videos in Web format quite yet, but keep an eye on our website, Smiles by Payet Dentistry, for them to begin appearing there within the next few weeks. You’ll be able to see and understand so much more easily, I promise! Quick Announcement! Check out our website, http://www.SmilesbyPayet.com, to see our new Whitening Specials for Valentine’s Day. Don’t forget that special day is coming up, and you want to look your best. A dental patient of Dr. Charles Payet in Charlotte, NC, who's thrilled with her smile after 6-Month Braces. Porcelain veneers are one of the most requested cosmetic dental procedures in dentistry, and they can make a dramatic difference. Here’s another case that we did a number of years ago. Craig wasn’t happy with either the color or the shape of his teeth, he’d tried whitening before with little success (this was back before we offered Deep Bleaching), and he also just didn’t have the patience to do touch-up whitening on any kind of regular basis. So veneers became the logical choice. In 1 fell swoop we gave him a dazzling white smile and changed the shape of his teeth to a less angled, less square, more flowing line of a smile from the sharply angled, very square with fang-like eye-teeth smile that he never liked. 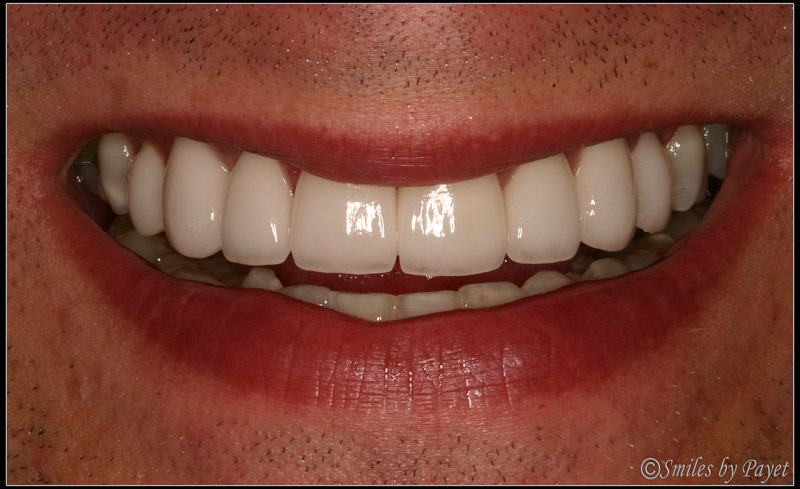 Before photo of Craig, who chose 8 Porcelain Veneers by cosmetic dentist Dr. Charles Payet in Charlotte, NC. Smiles by Payet Dentistry has been caring for patients since December 27th, 1999 in South Charlotte, and we recently moved to a new and improved location on Park Rd. I opened the practice 18 months after graduating from the University of North Carolina School of Dentistry in June 1998. While Smiles by Payet Dentistry is a General Dentistry practice, we offer an extremely wide range of services so our patients don’t need to see multiple specialists except in very complex cases. I am absolutely committed to constant learning and improvement, and have attended lectures and seminars by many of the nation’s premier post-graduate teaching institutions and lecturers in order to stay as current with the most modern techniques and materials possible. 50-75 hours per year in Continuing Education is not unusual for me, and in 2009 my goal is 75-100 hours. Rosemary B. is one of our Certified Dental Assistants and has been with us since back in 2007. A mother of 3 grown boys and a proud grandma to 2 grandchildren, she’s one of those people who just loves to help take care of people. With over 20 years of experience in dentistry, she is very knowledgeable and can answer most any of your questions. Along with Marie, she is there with me during your treatment to make it go as smoothly as possible. Samantha H. is our new (as of Summer 2010) full-time Orthodontic Dental Assistant. We are excited to have her on board to help take care of our growing family of patients with either 6MonthSmiles Cosmetic Adult Braces or Tip-Edge Comprehensive Orthodontics. With 13 years of experience in a full-time orthodontic office, she brings a lot of knowledge on how to make your braces appointments fast and smooth. Katrina B. (Insurance/Financial Coordinator) is our newest team member, and one we are really excited to have found. She says she is excited about finding us to work with, too. 🙂 She has been in dentistry for 22 years, having started as a dental assistant. Since her Dad was in the Navy, she was actually born in Morocco, Africa (!) and grew up in cool places like Guam and Hawaii, but she considers Fort Mill her home and moved back there in 2009. She is happily married with 2 children who keep her busy, but in her spare time she enjoys reading, gardening, crafts, and singing in her church choir. Adrianne M. (Registered Dental Hygienist) joined us early in 2010 and has been helping us keep our patients healthy and educated on taking good care of their teeth. With 11 years experience and a passion for particularly helping patients with periodontal disease, she is very excited about being part of an office that offers Laser Periodontal TherapyTM. She really enjoys going to local health fairs to educate the public on the importance of good dental health, especially in Hispanic communities, as she speaks Spanish. She has a 4yo daughter who is an incredible bundle of energy, so the rest of her free time is spent taking care of her daughter. We are blessed to have a Team that really enjoys working together, and their combined 100+ years of dental knowledge and experience are melded to provide you some of the finest dental care available.